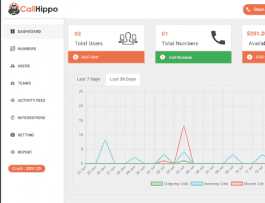 Breaking out onto the scene in 2016, CallHippo is a newcomer in the Hosted VoIP and Call Center market. Capable of offering phone numbers from over 50 different countries, CallHippo provides businesses with a complete telephony solution. In fact, CallHippo’s revolutionary approach provides businesses with advanced calling featured, capable of calling around the world, in three simple steps. With CallHippo, businesses can make calls to over 190 countries, and even gain real-time insights into their entire organization’s usage. With CallHippo, your business can replace costly and annoying desk phones with a built-in soft phone and mobile apps, and provide the same great support that even the largest Enterprise companies are capable of. With such a simple system, CallHippo is able to get your business’ support center up and running in as little as three minutes or less, while still providing your business with a completely capable and robust solution, packed with plenty of features and integrations. While they might still be new to the market, and only a few years old, CallHippo still manages to offer a competitive package worth considering. 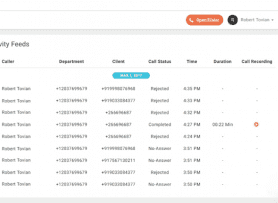 Designed to work as an entire call center platform, CallHippo aims to provide a simple yet effective solution. With an incredibly simple sign up process, your business only needs to complete three steps before users can start receiving and making calls. Simply sign up for service, select a phone number, and start adding users, and you’re ready to go. And once you get going, CallHippo also provides businesses with in-depth analytics to understand how the service is being utilized. Beyond a simple sign up process, CallHippo’s strengths don’t end just there. In fact, CallHippo is one of the most effective provider’s when it comes to international phone numbers, and international calling. Many U.S. based VoIP providers don’t even offer international phone numbers or calling, and if they do your business will be charged either for an international plan, or on a per-call basis. With CallHippo, your business can choose a local or toll-free number from over 50 different countries, and can even make calls to over 190 countries, without any additional cost at all. This alone makes CallHippo a strong choice for any business with an international presence. CallHippo also manages to offer a completely cost effective solution, with paid plans starting at only $6 per user. In fact, CallHippo is one of the only few providers in the market to offer a free or unpaid plan. With the Basic subscription, your business can provide phone service to 2 users per month, and still gains access to a soft phone, ring all devices, call controls, IVR, unlimited concurrent calls, voicemail to email, and even more. While your business is limited to only two users, this can be a great way to try out the platform and see if its right for your business. It also shows CallHippo’s confidence in their solution, since they are willing to give it away for free, knowing that businesses will come back for more. What Do You Think of CallHippo?